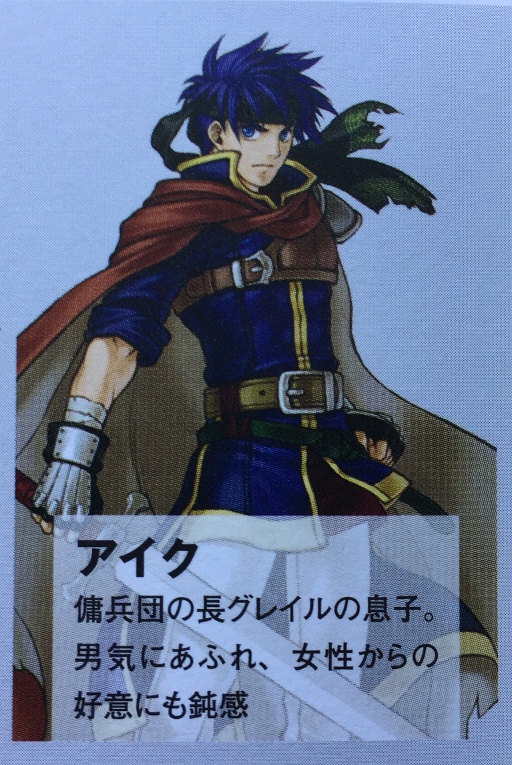 Ike and Soren are playable characters in Fire Emblem: Path of Radiance. If Ike and Soren achieve A-support, there is an ending in which Soren says: “There’s only one place for me to be, Ike… and it’s by your side.” Fans have long speculated about Ike and Soren having a possible romantic relationship, primarily due to a combination of Soren’s unwavering affection for Ike and Ike not being interested in any of his numerous other admirers. The positioning of the two as a couple is slightly more overt in the Japanese release and in some official Japanese-language publications, due to choice of language. 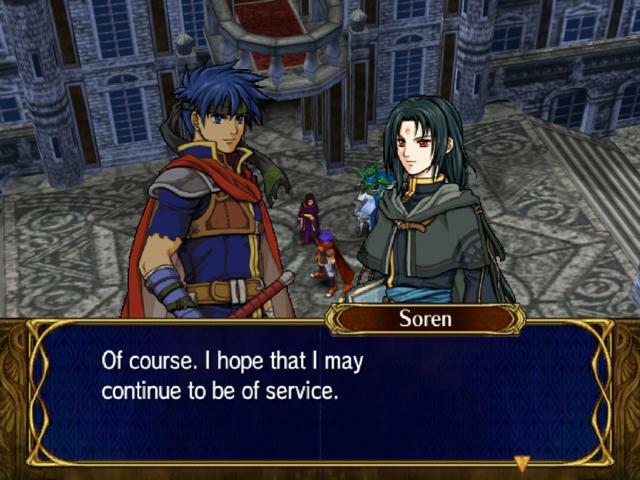 In the A-Level support conversation between the two in Fire Emblem: Path of Radiance, Soren tells Ike, “You are the only one that is special to me” (「あなただけが、僕にとって特別になったんです⋯⋯」). Furthermore, the books Fire Emblem: Path of Radiance Memorial Book Tellius Recollection: The First Volume (2016) and Fire Emblem: Radiant Dawn Memorial Book Tellius Recollection: The Second Volume (2016) frequently reference the bond between the characters, with volume 2 stating that Ike feels love for Soren (p. 87), though the term used, 親愛, expresses a kind of devotion that may or may not be romantic. However, like all Fire Emblem games, the nature of relationships between characters is at least partially determined by the player’s actions, so this ambiguity is likely intentional. Fire Emblem: Radiant Dawn features a hidden skit, available only if the player has previously cleared the game once, has imported a save from Fire Emblem: Path of Radiance in which Ike and Soren have an A-level support relationship, has achieved an A-Level support relationship between Ike and Soren in the current playthrough, has unlocked Ike’s sealed memories, and has kept Soren alive, that ends with Ike embracing Soren. This scene is referred to in Fire Emblem: Radiant Dawn Memorial Book Tellius Recollection: The Second Volume (2016) as the moment where their two hearts become one 「互いの心をひとつにした」(p.241). This is a small profile on page 21 of The Making of Fire Emblem: 25 Years of Development Secrets that paints a very telling picture of Ike. Nintendo/Intelligent Systems. 2015. The Making of Fire Emblem: 25 Years of Development Secrets. Tokyo: Tokuma Shoten (ambit). Japanese has an immense capacity for speaking indirectly and with double meaning, and the text here is an excellent example of that. 「男気にあふれ」Can mean both “chivalrous to a fault” and “overflowing with masculinity”, while 「女性からの好意にも鈍感」can mean both the passive, unconscious “he is oblivious to female attention” and the more active, conscious “he cares nothing for the affection of women”. Taken together with the nature of Ike’s interactions with Soren, this description allows for a clear reading of Ike as a gay character.